A view of Burin, looking towards a hilltop Israeli settlement. 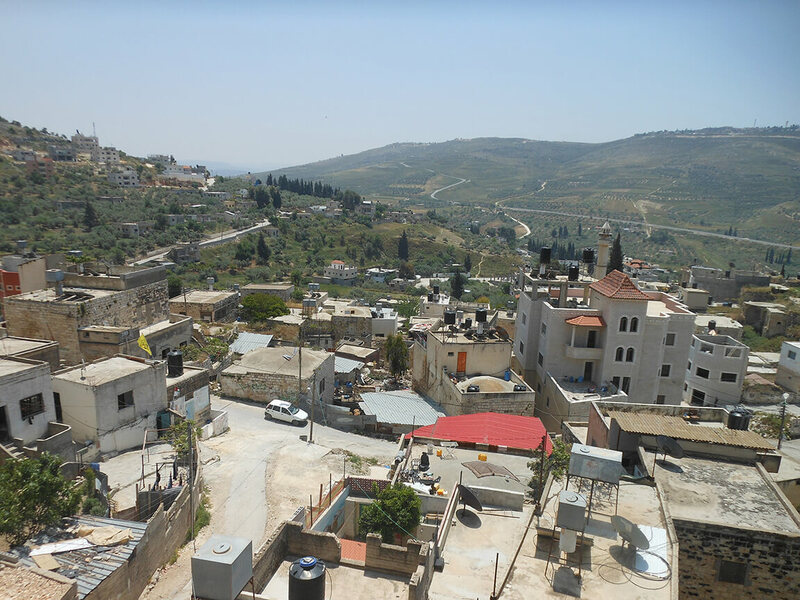 The village of Burin, south of Nablus city, faces ongoing encroachment onto its land by surrounding settlements. In recent years the village has lost 2,000 dunams of land to the Har Brakha settlement, and has been the target of violence from the extremist settlement Yitzhar. Four schools lie within Burin: a boys’ primary, a boys’ secondary, an all ages girls’ school, and a pre-school. What is the impact of occupation on their operation? We were invited to visit Burin by a woman we met in Nablus, one of the subjects of our “Why does education matter?” photo campaign. Emusa took an interest in why we were speaking to locals about education, and offered to show us her local schools. When we arrived in Burin three days later (having gotten lost on the winding roads reserved to access the village; a main highway completely ignores the village on its way to nearby settlements) Emusa immediately shepherded us into the village primary school. The boys were in their classes. A group of teachers accompanied us to the head teacher’s office. Businesslike, he spoke with us about the stress settlements place upon the village. “In short”, he said, settlers approach homes and sometimes attack them. Shots are sometimes fired. It affects the people here, and especially the children. A little boy in the first grade has selective mutism, blamed on frequent settler invasions of his home. 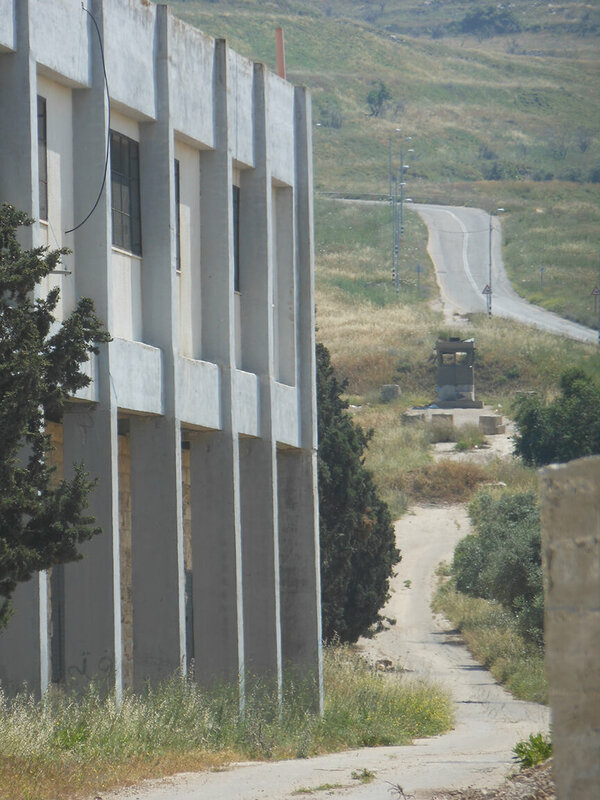 Sometimes, he continued, the soldiers come into schools and disrupt the schedule – particularly that of the secondary school, which is near the road that leads to one of the settlements. 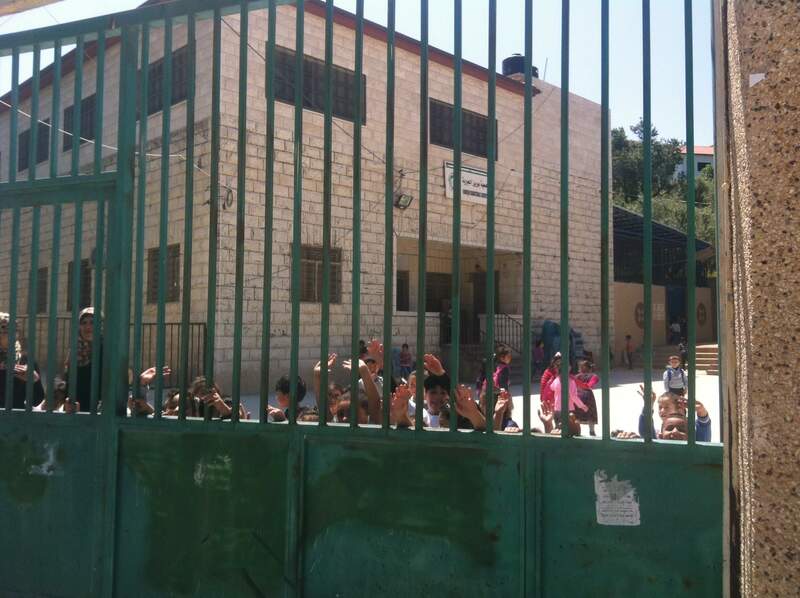 For two weeks Israeli soldiers shot tear gas inside the school, and prevented teachers and students attending. Even after, children were affected psychologically, and by their parents preventing them going to school out of fear for their safety. The boys’ secondary school, overlooked by a watchtower. Later we go to look at the secondary school grounds. The playground is rough and badly maintained, but more disturbingly there is an Israeli watchtower sitting on its boundary. This intimidating presence is regularly manned by soldiers who watch the boys work and play. Back at the primary school, the headmaster continues. Tear gas is used “all the time” to prevent children going to school, with soldiers claiming it’s a defence against stone throwing. Every entrance to the village of Burin is subject to intermittent checkpoints, disrupting normal life on a whim. Last semester, children were blocked from coming to school for 4-5 days. Teachers coming from outside the village could not even approach. Teaching time was lost, and children remain shaken up, afraid of repeat incidents. At one point villagers were held up at checkpoint for four hours. Explaining that they needed to go home, they were told “there is no Burin”. After a person with an international passport turned up, they were allowed through. It emerged that someone had been blamed for throwing stones. “It’s all on purpose”, the headmaster says – they want to ruin the education system. “Have many families have left because of the settlements?”, we ask. The teachers and the head teacher flare up as our translator asks this. After a minute of heated discussion, our translator explains that a little girl’s family left after she was killed by tear gas. Another woman, who lost a baby after inhaling tear gas, moved from her previous home to one further from settlements, but remains in the village. We are surprised that the villagers remain so steadfast, and yet there is no air of optimism here. “There is no positive for the future”, said the head. “I don’t think there will be a future”. We move on to the pre-school. The headteacher is more cheerful than her colleague next door. She has worked here for ten years, and remembers when the school was opened. Now, she says the school bus is stopped by soldiers – children cry for their mothers while staff try to calm them. Or, when the children are outside on their break, they see soldiers in the village and run back to their teachers for protection. We go into the main hall, where the children, five and under, are assembled to dance. They show us a routine – some shy, some completely absorbed in their moves. Our translator explains that the song is about the war in Gaza. 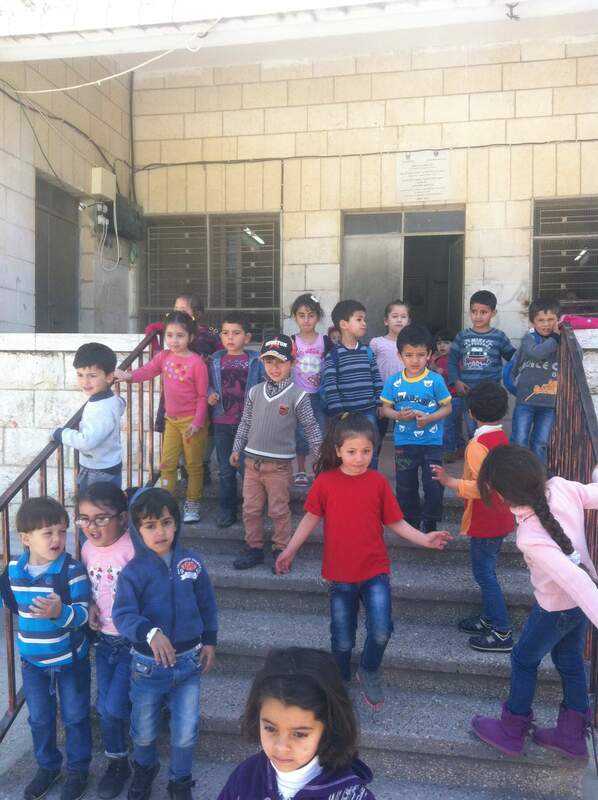 Finding sensitive ways to help pre-school children understand such grave events must be one of the biggest challenges of teaching in Palestine. Our last stop is the girls’ school, a German- and Swedish- funded project built in 2011. On the way, we stop by the side of the main road. On a dirt path, Emusa explains to us that a 19-year-old was shot by IDF earlier this year. Al-Haq reports that he threw a molotov cocktail. Emusa maintains that he was unarmed. The site of his death is visible from the playground of the girls’ school. Sometimes soldiers sit under the trees by the roadside, and the girls shout at them from the windows, the headteacher says. There is no social worker to talk with the girls. They are noticeably affected by events like the shooting, but the schools are ill-equipped to help them cope. Waved goodbye to by the pre-schoolers. How is this done? Not through relying on international governments, he says. They have copious insights into the situation in Palestine, and still they do nothing. Settlements contradict international law, but children have now been born and raised within them due to inaction by the international community. International support comes from the people. Governments will not put pressure on Israel until their people put pressure on them to do so. Emusa took us to her home and sat us down to a massive dish of lamb and dolmas, apologising the whole time for not doing more for us. We felt the opposite – she was a shining example of why the international community needs to do more for Palestine. We drove away touched by her generosity, and saddened by the hardship facing her village.